Disease Control Priorities Network (DCPN), funded in 2010 by the Bill & Melinda Gates Foundation, was a multi-year project managed by University of Washington’s Department of Global and the Institute for Health Metrics and Evaluation. 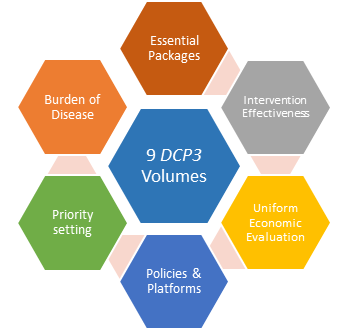 Over the 9-year life of the project, the Department of Global Health coordinated two key strategies to promote and support the use of economic evaluation for priority setting at both global and national levels: strengthening local capacity for evidence-based decision making and publishing Disease Control Priorities, 3rd edition. The DCPN secretariat and collaborators worked with global, regional and national partners in Sub-Saharan Africa, Latin America, China and the Middle East to enhance local capacity for conducting economic evaluations of the prevention and treatment of health conditions through training workshops and collaborative research. In Ethiopia, DCPN collaborators also worked directly with partners to apply the DCP3 methods and results as relevant to support health priority setting. At the regional and global levels, DCP is carried out strategically targeted policy discussions, building on partnerships with WHO/EMRO to facilitate uptake of DCP3 evidence by Ministers of Health, Transportation, Social Welfare, and others. Together, these activities advanced the development of improved economic tools and dispersed capacity for evidence-based priority setting for health and connected decisionmakers with economic information to guide regional and national level policymaking. The DCP3 effort was led by its Series Editors: Dean Jamison, Hellen Gelband, Sue Horton, Prabhat Jha, Ramanan Laxminarayan, Rachel Nugent, and Charlie Mock. The 9 volumes are published electronically and in print, along with all individual chapters and additional resources. DCP3 organized interventions into 21 essential packages that group the interventions relevant to particular professional communities. Each package can contain both intersectoral actions and health-system interventions. Specific findings from packages point to the attractiveness of widely available surgical capacity, the value of meeting unmet demand for contraception, the potential of a multipronged approach to reducing air pollution, and the importance of maintaining investment in child health and development far beyond the first 1000 days of a child’s life. Collectively, 218 health system interventions were selected and constitute essential universal health coverage (EUHC). A subset of 108 of these interventions, selected using more stringent criteria, are suggested as a highest priority package (HPP), constituting an important first step on the path to EUHC. Five platforms (population based, community level, health center, first-level hospital, and referral hospital) provide the delivery channels for EUHC. The interventions selected for the HPP and for EUHC, and the definitions of platforms and packages, are necessarily quite generic. Every country’s definitions and selections will differ from these and from each other’s. Nonetheless, the authors view DCP3’s selections to be a potentially useful model list and a starting point for what are appropriately country-specific assessments. The essential package and EUHC concepts are new in DCP3 and are set up to be easily adapted to country-specific analyses. The costs estimated for the HPP and EUHC are substantial. The HPP is, however, affordable by low-income countries prepared to commit to rapid improvement in population health, and the EUHC is affordable by lower-middle-income countries. Many upper-middle-income countries have yet to achieve EUHC, and they might also find that the EUHC interventions are a useful starting point for discussion. Reducing premature deaths by 40% by 2030 (known as 40×30) is a goal that closely mirrors Sustainable Development Goal 3. DCP3’s calculations suggest that low-income countries implementing the HPP and lower-middle-income countries implementing EUHC by 2030 will make substantial progress toward this 40×30 target but are likely to fall short (unless there is unexpected substantial intersectoral action to raise excise taxes on tobacco and adopt other fiscal interventions to reduce behavioral and environmental risk factors for non-communicable diseases). DCP3 has shown that it is possible to identify the main sources of health-related financial risk and impoverishment, to estimate the value of risk reduction, and to use a new method developed, the extended cost-effectiveness analysis, to help achieve efficiency in purchase of financial risk reduction. This concern for efficiency in (government) purchase of financial protection is new in DCP3, but DCP3 has only made a start in applying these methods. Much remains to be done. In addition to the aggregate conclusions of DCP3, each volume provides rich detail on policy options and priorities. This granularity in the volumes makes them of use to the implementation level of ministries as well as the policy level. Population-level: This platform captures all nonpersonal or population-based health services, such as mass media and social marketing of educational messages, as typically delivered by public health agencies. Community: The community platform encompasses efforts to bring health care services to clients, meeting people where they live. It includes a wide variety of delivery mechanisms. Specific subplatforms include the following: health outreach and campaigns (such as vaccination campaigns, mass deworming, and face-to-face information, education, and communication); schools (including school health days); and community health workers, who may be based primarily in the community but also connected to first-level care providers, with ties to the rest of the system. Health center: The health center level captures two types of facility. The first is a highercapacity health facility staffed by a physician or clinical officer and often a midwife to provide basic medical care, minor surgery, family planning and pregnancy services, and safe childbirth for uncomplicated deliveries. The second is a lower-capacity facility (for example, health clinics, pharmacies, dental offices, and so on) staffed primarily by a nurse or mid-level health care provider, providing services in less-resourced and often more remote settings. First-level Hospital: A first-level hospital is a facility with the capacity to perform surgery and provide inpatient care. This platform also includes outpatient specialist care and routine pathology services that cannot be feasibly delivered at lower levels, such as newborn screening. DCP3 contends that a primary goal for all countries to achieve during the SDG era could be to ensure most patients have access to fully resourced, high-quality, first-level hospitals—a goal that, although aspirational, could be feasible in by 2030. Referral and specialty hospitals: This platform includes general specialists that provide secondary and tertiary services.